Three U.S. battleships are hit from the air during the Japanese attack on Pearl Harbor on Dec. 7, 1941. In the first wave of aerial attacks on Pearl Harbor, 183 Japanese planes dropped bombs on American naval vessels. Other planes bombarded U.S. airfields. When it was over, the USS Oklahoma had capsized, and another battleship, the USS Arizona, was destroyed. In the end more than 2,400 American service members and civilians were dead. After 75 years, there are fewer eyewitnesses to the events of Dec. 7, 1941. But one man does have a story from that infamous day — a story that he says no one believed for decades. 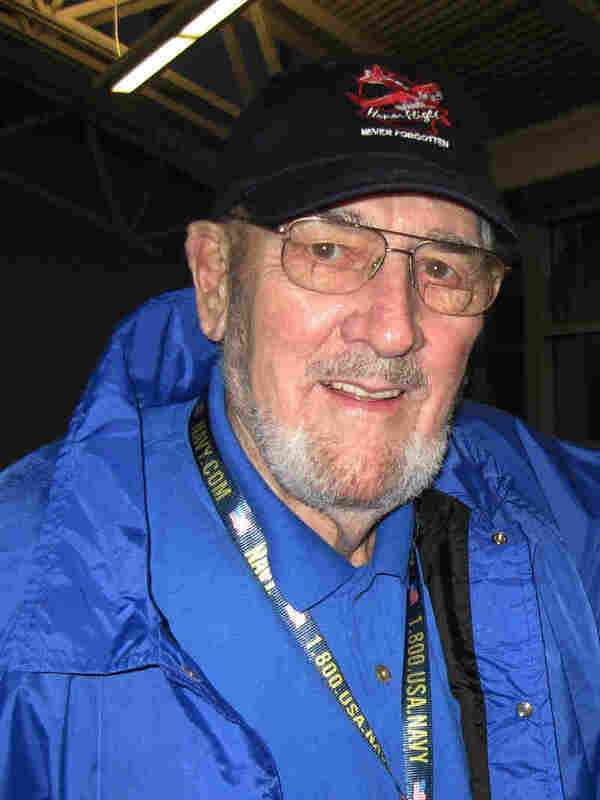 Will Lehner, a Pearl Harbor veteran, attends an honor flight trip in 2010. Will Lehner is from Stevens Point, Wis. In 1941 he was 20 years old and serving in the Navy, where he was assigned to the USS Ward. 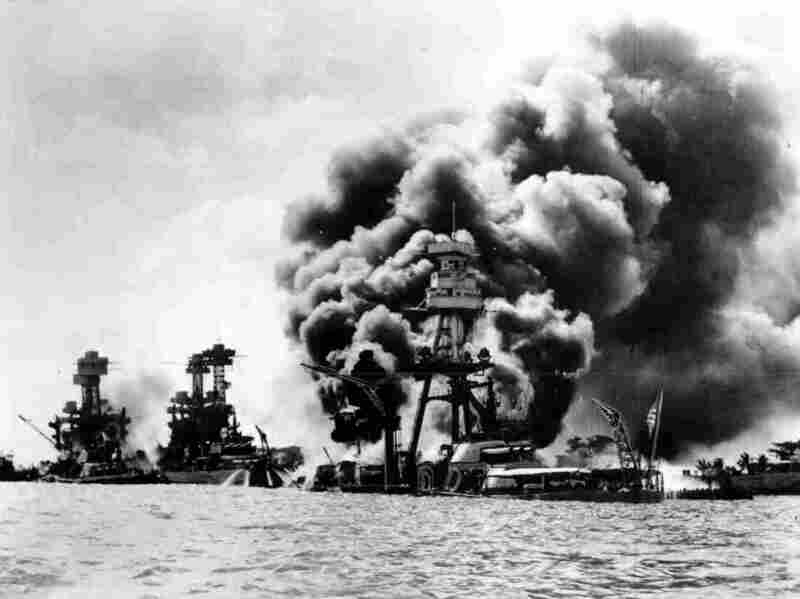 "At the entrance to Pearl Harbor our job was patrolling back and forth for a week at a time," Lehner says. He was on one of these patrols during the early hours of Dec. 7, 1941. During that time, before the surprise attack, is when Lehner says the Japanese navy sent small surveillance submarines to the harbor. He says his crew saw one, and fired. "I saw the shell when it hit the sub, right in the hull," Lehner says. "It was about 75 feet long and about 4 or 5 foot in diameter." Lehner and his crew engaged the Japanese navy before the aerial attack on Pearl Harbor took place. He says they hit the submarine approximately an hour-and-a-half before the aerial attack began. "We saw a lot of smoke and planes diving. We didn't know how bad it was until about 1 o'clock in the afternoon, and we had to go in," Lehner says. "That's when we saw all of the destruction. There were bodies floating in the water." For many years people did not believe Lehner when he said he had sunk a Japanese submarine before the attack occurred. But just over a decade ago, Lehner went back to Hawaii and down into the water on a mission to find the sunken submarine. "Well, I'll tell you, when I saw that submarine laying there, the hairs on the back of my neck just stood up," he says. Lehner says no one has apologized for not believing him for so many years, but he's not upset about it. "No one ever apologized, but I also say, 'Hey, we found it now,' " he says. "So, now there's definite proof." An earlier version of this story stated that no one believed the story of the sunken submarine for decades. That was Will Lehner's experience. He says the people he told the story to didn't believe him. But there were records and reports about the submarine and its sinking.